Despite sitting through almost three years of the guys’ karate lessons, I still barely know an inner forearm block from the Internet. I’ll go through fits and spurts of trying to figure it out, and I do try to pay attention when the guys are “teaching” me, but for the most part I’m pretty ignorant. Somehow during those three years, Big Guy has gone from a kindergartener who could barely keep his balance to a third-grader who displays impressive flexibility, power and, usually, balance. I finally figured that out last weekend. The lighting bolt hit me after a demonstration Saturday during a festival on post. I watched though my camera lens, the same way I watch many of the guys’ sports events. When I began to edit the photos the next morning, I was stunned. 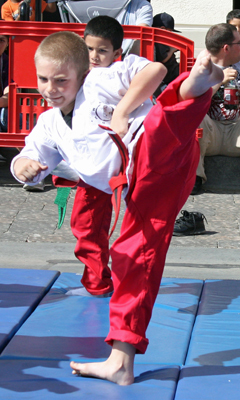 One shot captures a kid with a leg in the air, parallel to the ground at chest level – he used to bend his knee toward his tummy and call it a kick. Another shows him balanced on one foot, his other leg in a perfect right angle. Wow. Just wow. When did that happen? I would have noticed it in baseball, and I clued in just last week to a dramatic improvement in basketball that came once he decided to listen to two season’s worth of coaches and use the backboard and both legs when shooting. Maybe it’s because karate still is a jumble of confusion for me, a dizzying combination of kicks, punches and forms where “right” depends to a large extent on tiny differences in positioning that still escape my understanding. Or maybe, just maybe, it’s because I’m guilty of the very thing I’m always on the guys about: Of not noticing a change for the better because my brain hadn’t turned loose of a stereotype formed long ago. It makes me wonder what else I’m not noticing because I see it every day.